Mother's Day, 31sth March 2019 is a special event in the floristry calendar, but also a very special occasion for most families around the nation as we celebrate the respect, gratitude and admiration we have for our mothers and those who help us in everyday life. THE REASON SUPERMARKET BOSSES BUY THEIR VALENTINE'S FLOWERS FROM US! Valentine's Day is almost upon us and as has become the norm Supermarkets will be stocked to the rafters with roses and Valentine's bouquets. They will appear to be cheap and very good value for money. However, did you know that the managers from supermarkets buy their Valentine's flowers from local independent Florists. This is because they witness first hand the grade, condition and storage conditions of the roses they buy. Last year Tesco was reported to have purchased 1.5 million roses and many of these were left on the shelves. One manager from a local supermarket told us last year that the roses are cut at least as week before the big day, are not conditioned for sale and longevity and are kept in cramped conditions in large warehouses with other products such as fruit and vegetables. Illustrating that supermarket staff know very little about horticulture and care even less for the product they are expected to sell. And with the vast quantities of roses in front of them with thousands of other products to shift this is hardly surprising. By comparision, your local independent florist, will purchase the highest grade rose, which cannot be found in a supermarket, will know exactly when the flowers were cut (in our case ALWAYS the day before our delivery), condition them carefully according to their type and use years of training to present your flowers in the most professional way. Our roses will last up to 3 weeks, if you follow the instructions below. Now you wont get that from a supermarket! When you get your bouquet home your rose stems will have "healed over" retrim the stems of the rose by removing approx 2cm and cut at a 45 degree angle. This allows the rose to drink. Fill the vase 2/3 full and remove any leaves below the water line. Add the flower food. Place your roses in a cool spot, away from draughts, direct sunlight and excessive warmth, i.e radiators and well away from fruit. Check the water level daily and top up or change. Add more flowerfood if you change the water. Every 2-3 days retrim the rose stems by removing approx 1-2 cm of stem. Remove any drying petals. Sit back and enjoy. The history of giving your loved one Valentine’s Day flowers comes from the old-fashioned custom of sending floral bouquets to pass on non-verbal messages. Introduced in the 18th century by Charles II of Sweden, each flower had a specific meaning attached to it, making it possible to have an entire conversation using only flowers. Today, people continue to send flowers on special occasions or to express sentiments of love and admiration. Roses – A holiday tradition, Worle Florists offers a selection of single roses or one, two, or three dozen long-stemmed or short-stemmed red roses to send to your lover this Valentine’s Day. Three Days of Valentines – Your love is so hot that you need more than just one day to celebrate. 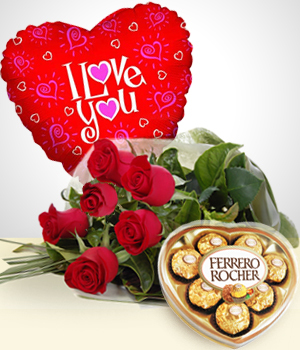 Surprise your sweetheart by sending her/him one Luxury bouquet on Valentine’s Day and two others during the following days. Continue celebrating your love for one another after Valentine’s Day is over. Scent with Love – Send your crush a mixed bouquet of pink oriental lilies, white freesia, and pink roses this Valentine’s Day to find out if Cupid’s arrow has struck and she/he feels the same way about you! Valentine’s Day Spectacular – Use Valentine’s Day as an opportunity to remind your mum and/or grandma that you love her and are thinking about her, whether she is near or far, with a beautiful arrangement of pinks and white flowers. Loves Me, Loves Me Not Daisies – Single or not, remind your friend how fabulous she/he is this Valentine’s Day and how much you treasure your friendship by sending this pretty arrangement of tulips. Christmas is the most wonderful time of year in the floristry industry. Despite the days getting shorter the world is full of light, sparkle and smells that evoke memories of Christmases past and florists come into their own with their creativity and imagination. Customers buy and request the best of our creations and as the whole range of seasonal produce, flowers and foliage become available (in the short window of the month of December) we have to get our skates on to ensure the shop is looking wonderfully festive. This year we are proud to announce the return of the Worle High Street Christmas Fayre, (8th December 2017 , 6-10pm) where we along with all the other traders in the High Street will be sellling our wares, some of which will be extra special and individually created for the event. So, whether you are buying a unique, special Christmas gift or decorating your home with something from our wonderful range of wreaths, garlands, candle arrangements or flower displays, you will find something to brighten the lives and homes of everyone at our shop and on-line. Worle Florists' Launch party, a celebration of almost a year trading under new management and 35 years as Worle's premier florist, was held at our premises on 3rd June. I was an enormous success and we would like to thank everyone who attended and gave their support. Special thanks go to John Penrose, The Mayor Jos Holder, Councillor Roz Willis and Councillor Richard Nightingale, who all gave their time at a very busy time in their professional calendar. One of our tropical arrangements - sure to grace any home and bring a touch of the Caribbean to Weston -super-mare.